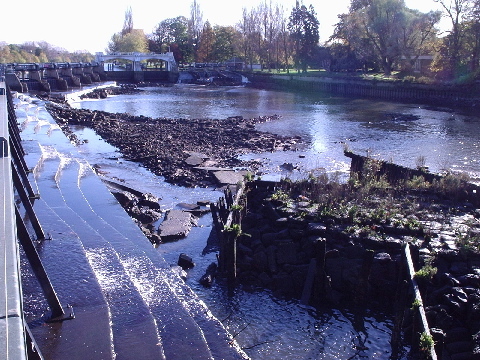 There are some photos of the weir with gates raised in the Latest News section ( November 2006 ) , you can really get an idea of the power of the river in the photos. Fish caught in Teddington weirstream. 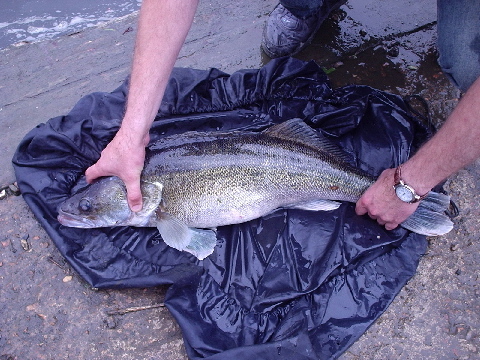 Here we have a 13lb zander, that was caught by the EA electro-fishing team in the weir stream , it was tagged and released . 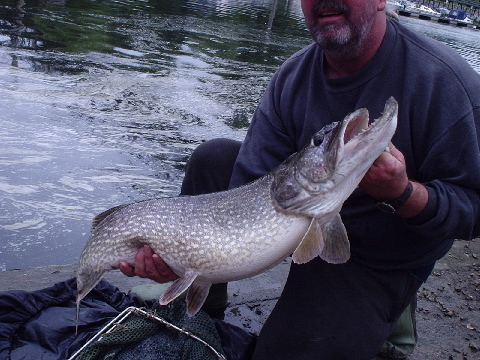 A 25lb pike also caught by the EA electro team in the weirstream, athough it has a severely deformed lower jaw, it certainly hasn't affected its appetite ! 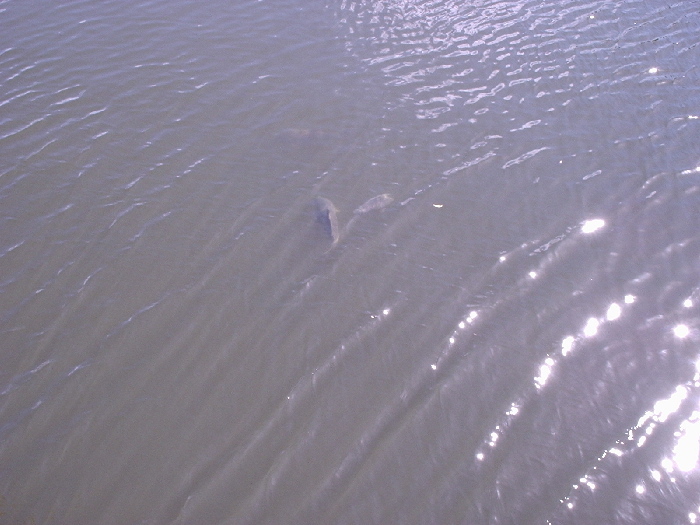 In the hot weather at the moment ( July 2006 ) we are seeing a large number of huge carp congregating around the lock . I snapped this photo yesterday ( 30th July 2006 ) from the top of the lock 13 feet out of the water , there were up to 10 very big carp milling around in the fairly shallow water to the side of the skiff lock. The following photos are posted to help the fishermen who come to Teddington weirstream to fish. 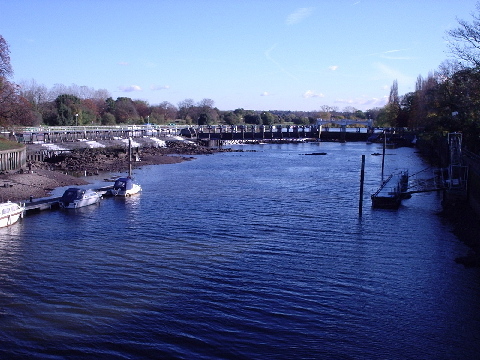 Once a year (usually November) the reach below Teddington Lock is allowed to 'draw-off' , meaning that we lose an extra 5 feet of water off our normal low tide level. This exposes parts of the riverbed that normally wouldn't be seen. In this photo you can see the 'reef' with a bank of gravel and rocks behind it, the reef is normally visible at low tide but the rocks usually have 18 inches of water covering them. In this next photo you can see another 'reef' usually covered by 18 inches to 2 feet of water. The photo is taken from the top of the large roller sluices you can see in the top of the previous photo. 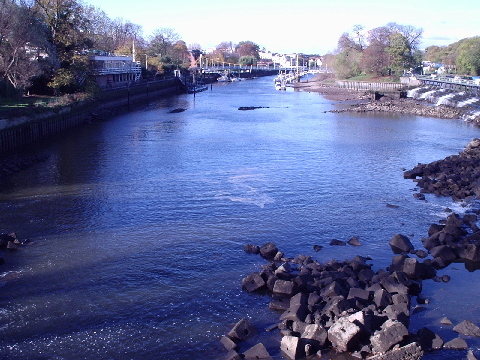 The reef hugs the wall of the Lensbury club and is very dangerous to approach by boat at normal low water. There is a deepwater channel (about 4 feet wide) that runs between the wall and the reef. The photo below illustrates the 'finger' of rocks and gravel that extends from the point of the bay on the right hand side of the photo almost to the other bank, the two small 'islands' are high points on the finger. Many pleasure cruisers have damaged their props on these ! On the draw off , about 12/18 inches of water covers the finger. There is a deepwater channel on the left hand side of the last 'island' and if there are any gates open on the weir, the current in here can be fierce. In front of the 'finger' and into the bay on the right , the water depth is up to 30 feet deep, having been scoured out by the roller sluices over the years. The rocks you can see in the foreground were dropped to try and break up the water flow, to no avail. 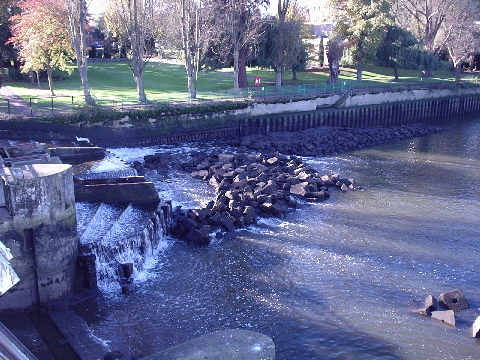 In this last photo , taken from the footbridge looking towards the roller sluices, and still invisible even in draw off conditions, is another finger of clay and rocks that extends from the tip of the reef seen in the first photo , almost to the tip of the pontoon you see on the right hand side of this photo. Even on draw off, there is still 2 or 3 feet of water covering it. All in all, Teddington weirstream is a dangerous place to be in a boat if you don't have any idea of the bottom contours !